While it wasn’t quite Lord of the Flies, to have good day meant being stealthy enough to fly underneath the seventh grade radar, usually by hiding in the school library during recess. I looked forward to the three o’clock bell and returning home to the quiet support of my family. After being greeted by Mom at the front door, I’d put away my jacket, and stow my books in my room. Then it was off to the kitchen for an afternoon snack. Usually, I started my search for the perfect treat by staring into the pantry and opening drawer and cupboards. Did my sister eat the rest of the Chips Ahoys in the cookie drawer? Was there any Ovaltine left? I opened the refrigerator door figuring I could have a Dannon coffee yogurt. Then I gazed upon a large glass serving bowl covered in Saran Wrap. Immediately, the small hurts and anxieties of the day vanished. 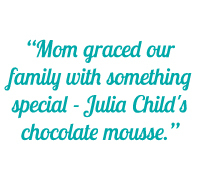 While I was at school, Mom cracked open her worn copy of Mastering the Art of French Cooking and graced our family with something special – Julia Child’s chocolate mousse. That cheap, faux crystal bowl contained a luxurious concoction of scrumptious contradiction – heavy but fluffy, bitter but sweet, rich but light as air. It was dark chocolate, sugar, butter, eggs and cream – plus maybe a little rum – whipped up into a frothy, edible pillow of afterschool comfort. Who cared if my nose was a smidge too big or I needed to pay closer attention to my wardrobe? Every delicious spoonful eliminated the bitterness of the day and showed me that the world could be a sweeter place, at least for a little while. 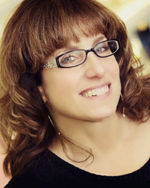 Anne-Marie is a professional blogger, freelance copywriter, and social media consultant. Besides running several of her own blogs including A Mama’s Rant, This Mama Cooks! and My Readable Feast, she has blogged at ClubMom, 451Press, b5Media, DotMoms, and for clients like MOTHERS at MOTHERS Book Bag. Her blog for Studio One Networks, Citizen Mom’s Family Journal, won a 2006 webaward and a 2006 Silver Davey Award. You can find Anne-Marie at her website This Mama Cooks!, as well as on Facebook and Twitter.